A trail runner was rescued from Sunset Peak on Sunday in the midst of the Lantau 2 Peaks trail race. The temperature reached a high of 31 degrees Celsius and one of the competitors succumbed to heat exhaustion. The nearest checkpoint was far away. Race organiser Michael Maddess said it was safer to fetch him by helicopter than to have him stumble down the mountain to a place were he could rehydrate or cool down. “The runner is on the road to recovery,” Maddess added. Meanwhile, Hong Kong-based Australian Vlad Ixel won the 21-kilometre race in a time of two hours, 29 minutes and 23 seconds. 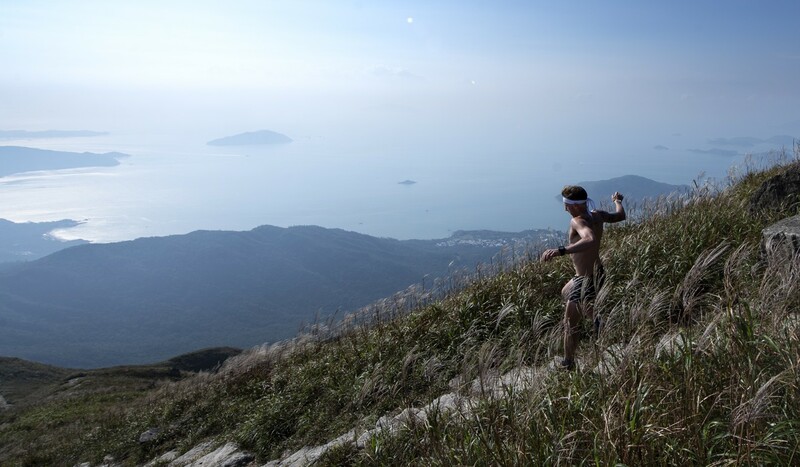 The race started in Tung Chung and took runners over both Lantau Peak and Sunset Peak, with a total elevation gain of 1,800 metres. Ixel has been spending the off-season taking part in triathlons, so is not in peak trail running condition yet. Ixel said that knowing he was in first place helped him push on through the pain. If he had been further down the running he may have relaxed his effort. Chinese runner Li Qiang trailed Ixel and came in just over a minute behind. Taiwanese runner Chou Ching finished in third in 2:36.29. Hong Kong-based British runner Lauren Gibson was the first woman over the line in a time of 3:10.13. She echoed Chou and said the last downhill was the hardest section of the race. “It was very hard to run down and really tough on the legs,” Gibson said, adding that the heat made it even harder. She was trying to find a balance between hydration and not taking on too much water. Katia Kucher from Canada took second place six minutes behind Gibson in 3:16.16, with third placed Angelika Hahn from Germany just 20 seconds behind her.